Students and faculty examine an "ancient" cuneiform tablet written for Hopkins' first President, Daniel Coit Gilman. 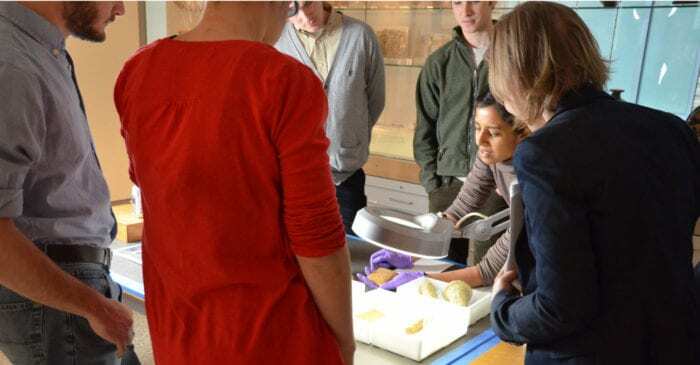 Nearly every day, faculty and students re-discover extraordinary facts and details about objects in the museum’s collection. This page highlights some of these new re-discoveries and hopes to bring attention to some of the wonderful and previously hidden histories of our museum objects. In the Spring of 2012, we identified two of the relatively modern cuneiform tablets written by former Johns Hopkins faculty member Paul Haupt. A gifted and much accomplished specialist in Semitic languages, Professor Haupt was also known for writing dedicatory clay tablets to his esteemed colleagues to congratulate them on major milestones. Written in Akkadian, these “modern” tablets to the first Hopkins President Daniel Coit Gilman and Classics Professor Basil Gildersleeve evidence Haupt’s brilliance but also his humor and collegiality.